SEM is a standard "workhorse" technique for characterizing particulate samples, found in many laboratories worldwide. It provides excellent imaging of the surfaces of agent particles and other material in a sample, and is an excellent initial technique to be applied for identifying likely agent particles for analysis by other instruments. When combined with EDX, the elemental composition of the material in the imaged region can be determined. Surface characterization and imaging of the various spore samples (e.g., Bacillus globigii, Bacillus thuringiensis, Bacillus cereus, and Clostridium sporagenes) was performed with a Hitachi S-4500 cold field emission SEM. Acceleration voltages of 6 keV and less were typically used to document spores and associated residual materials on each of the provided sample mounts. No conductive coatings (e.g., gold, platinum, or carbon) were applied to any of the samples, avoiding coating artifacts which could be misleading in characterizing the samples at higher magnifications. The spores appear to be resistant to electron beam damage; nevertheless, every effort was made to avoid beam damage to spore and residual material surfaces while imaging. This was particularly important when working with the spores in silicon aerogel matrix, as this material was easily deformed and damaged by the electron beam. Figure 13.1 shows a representative sample of SEM micrographs of varying particle morphologies which can be traced to differences in the "weaponization" processes used to generate the samples. Very little silica is observed on the Bacillus spores in Figure 13.1a, while Figure 13.1b shows Bacillus spores (indicated by the arrows) coated with fumed silica. 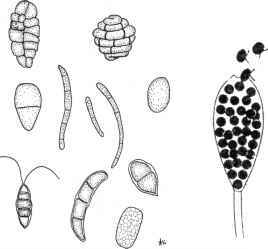 The Bacillus spores in Figure 13.1c exhibit a distinct type of "shake-and-bake" silica coating in sharp contrast to the spores in Figures 13.1a and 13.1b. The Clostridium spore shown in Figure 13.1d shows yet another type of silica coating, i.e. colloidal silica particles. 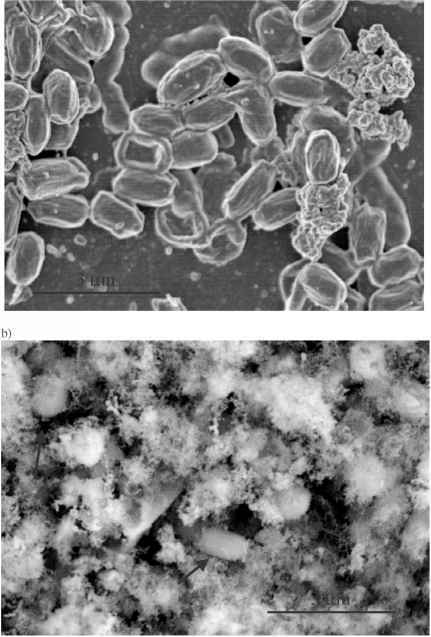 FIGURE 13.1 SEM micrographs of weaponized bacterial spores. For analysis, the powdered samples were dusted onto a sample platform of either carbon tape, silicon, substrate or TEM grid; no coatings were applied to the samples. (a) Uncoated Bacillus spores mixed with clumps of silica (right side of the image). (b) Bacillus spores, indicated by the arrows, are seen embedded in fumed silica. (c) Individual Bacillus spores (indicated by the arrows) coated with silica. The spores are dusted onto a TEM grid. (d) A Clostridium spore coated with colloidal (spherical) silica particles.